I am not into tchotkes. While life with three boys and my own overly-relaxed attitude about cleaning cause us to live with a certain degree of clutter, I tend not drawn to little things that sit on shelves. I am, however, pretty addicted to Etsy. I love the idea of all these artisans working away at home, knitting and painting and sewing and silk-screening and baking. There are times I get on Etsy, not because I want to shop, but I simply want to see what people out there are making. And I find all sorts of cool stuff. Some weeks ago, I was drawn to an Etsy shop. It wasn't because these artisans were making things that I was particularly searching for. No, I went to their shop because I learned that the artists behind indigotwin are identical twin sisters from Maine. And I have identical twin boys. And we had lived in Maine. So as I was perusing indigotwin's very cool folk art, I got an idea. 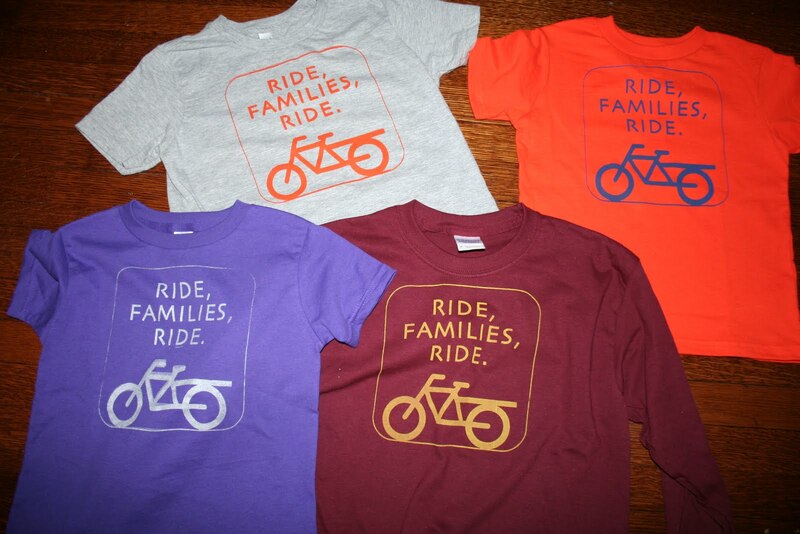 How about a family Christmas gift? And wouldn't it be cool to have those personalized portrait statues? And while it was really personalized, maybe we could include something really personal, like one of our bikes? 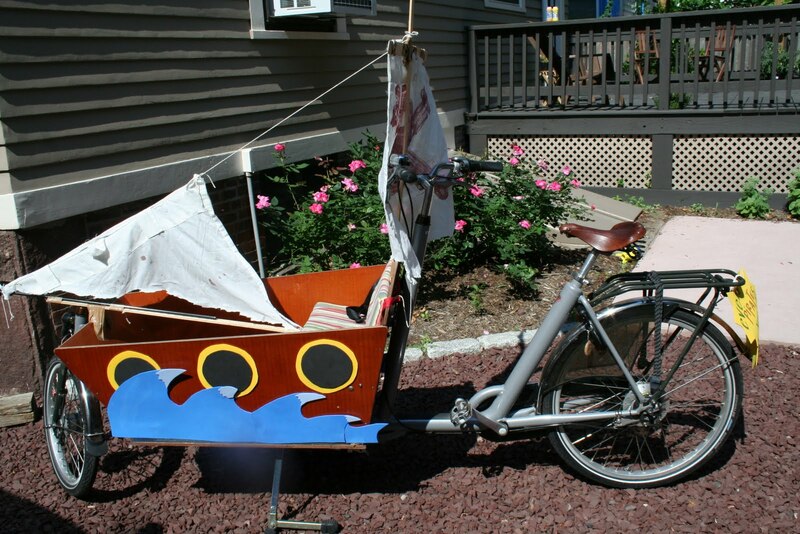 So I emailed indigotwin, and they were totally up for the idea of creating our family portrait complete with bakfiets. I filled out the questionaire and mailed them a few photos. They emailed me a sketch of their design and we had a nice back-and-forth about a few changes. And then, a package arrived on our porch. And no, I couldn't wait until Christmas to share it with my family. and orange hoodie with bike graphic. Randy Cohen, a.k.a The Ethicist, is an avid bike commuter. Look at his response when a parent asks about the ethics of transporting his kids by bike. Could you ever imagine a parent asking about the morality of transporting a child by car? 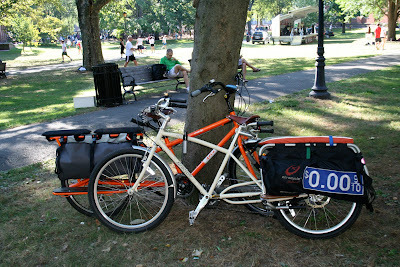 So I last posted on The Path Less Pedaled Laura and Russ's visit to New Haven. 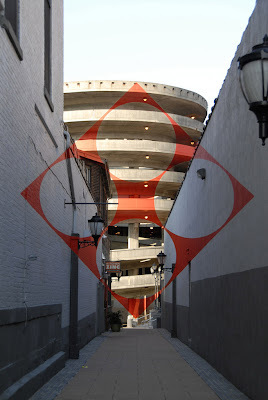 Here is their posting on their time in New Haven with some amazing photos, including a shot of the Full Hands family in its entirety (a very rare sighting given that I normally like to be the one taking the pictures). You can find more photos by Russ at his photography website. 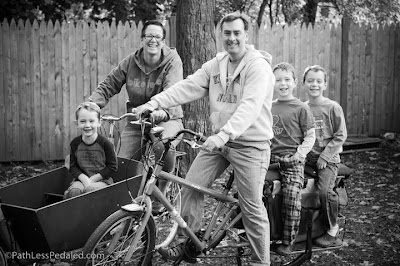 I'm not sure how I discovered Laura and Russ's blog, The Path Less Pedaled, but I found it early on when they were selling off most of the stuff they owned and started packing for their across-the-country bike tour. While I have yet to bike tour, I was immediately drawn to their unfolding story. Travel and bikes are two things of which I am incredibly fond and Laura and Russ are both creative people, a jewelry maker and photographer respectively. Their blog is more than an awesome adventure story, it is also filled with stunning photographs of people, places, and food. Reading their posts, brought me back to my travel adventure days and make me yearn for the time when I am back out there. Therefore, it was exciting to see that, now 14 months into their journey, Russ and Laura were going to ride through New Haven. P and I happily offered them a bed in our home, thinking of all the times kind strangers helped us out along the way during our years living and traveling abroad. The boys were really excited to have them as guests and each night before they went to sleep asked, "Will Russ and Laura be here when we wake up in the morning?" S and C quizzed them on all the States they had ridden in and loved checking out all the electronic gear that the duo had with them. Russ and Laura pedaled this past year. I like knowing the guys saw one more example --up close-- of people making different life choices than the mainstream. Who knows? One day they may decide that they, too, want to take off on a year-long bicycle adventure and they can tell the tale of when "The Path Less Pedaled" (as C referred to them, often instead of their names) came and stayed at their home. The boys are excited to meet Mona, Laura's 'pet' skunk who has traveled this journey as well. Laura checks out the map before departing on their next leg. They'll make it up to Boston, then take a train back to Oregon, where they'll work, save money, and strategize where they'll bike to next. You can imagine how much this pedal powered phone charger really intrigued the fellas. The boys walk Russ and Laura out as they head off after three days in New Haven. Yes, we have a lot of firewood that needs stacking! Check out Russ and Laura's Facebook page. 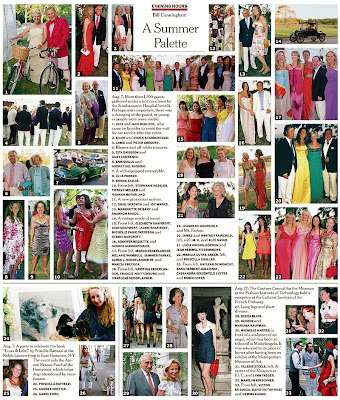 You can see some photos of their time in New Haven, including a great portrait of the FullHands family. Please take the time to watch this video of one city's brilliant campaign to get folks out on bikes. It not only is exciting for its message about choosing a bike to get around, but for its pure marketing genius. Hey-- go on over to Xtracycle's blog, www.everydayadventures.com, and check out our posting about Xtra's 2010 Freeloader bags on our Yuba. Yup, they work well together. Really well. This summer I bought another fabulous bike-themed t-shirt on Etsy by Loftymornings. I have a few other shirts from this wonderful seller, Kate, and they are soft and fun and people always comment on them. I fell in love with this graphic immediately. 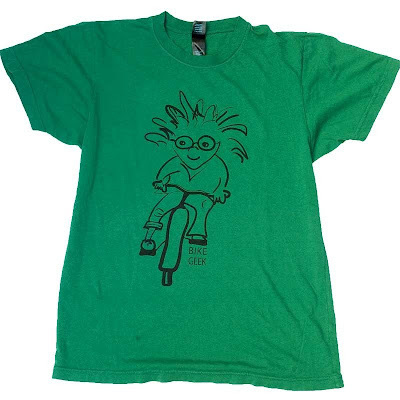 Every time I wear this tee, my boys comment that the drawing actually looks like me a bit-- it's not quite my hair and I do always ride with a helmet, but I wear glasses and yes, I have been known to let long periods go by without shaving my legs (great detail on the shirt that I don't know if you can see in this photo). At some point in school today, I looked down and saw this. Yes, I was wearing my right pant leg still clipped. I was spoiled in the past. Given that our bakfiets had a fully enclosed chainguard (and skirt guard), I never needed to worry about what I was wearing while riding. When we switched over to riding the Yuba this summer, I either sported shorts or capri pants so I never thought much about the pants-getting-stuck-in-the-chain thing. Last week, I had a rude awakening within a block of leaving the house when the bottom of my pants caught in the chain. I was lucky that I held on and didn't dump the fellas in the back. I had to quickly pull over, ask the boys to dismount, free my pants from the chain, and tuck and roll the right pants leg so we could continue the ride. I now clip my pants when riding. 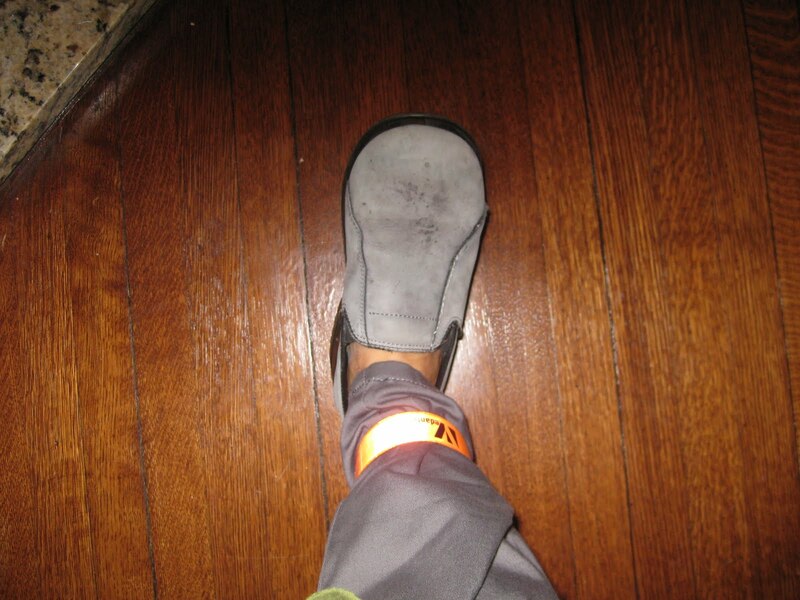 Yet when I arrived at school today, I forgot to liberate my pant leg from this oh-so-attractive neon orange binding so was walking around just so. p.s. Any Yuba owners out there adapt some sort of chainguard for your bike? Would love to see some examples. 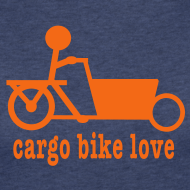 After my fun making box cargo bike/bakfiets t-shirts and then adding another long-tail bike to our fleet, I have wanted to try my hand designing a new shirt representing our Xtracycle and Yuba bikes. These weekend, I pulled out my EZScreen Print and set to work. We went for simplicity for the saying, simplicity in the bike design. While they are not quite up to professional quality silk-screened shirts, I was pretty pleased with the results. We did have a bump in the purple shirt when we pulled the squeegee over the screen so we did blur the silver bike some. F declared that this one is a bit "squidgy, " which sounds right to me. We just decided, however, that once it dried, it just looks like the bike is in action. We'll take that. As soon as it came out of his mouth, I turned my head and looked directly at him. I couldn't stop the huge guffaw from escaping before I asked, "Did you just say what I think you said?" "Yes," he confirmed, half-laughing himself, half-chagrined. We have become one of those family. We swore we never would. We had held off pretty well for eight years. We met in the Peace Corps. He was the volunteer traveling with the smallest bag. I was impressed. We've valued simplicity and loved down-time, hanging out together, reading, sitting on porches. We had no car. We had a set of twins. Then one car. But we kept to one car and had a third son join the party. Then we began riding bikes. We took turns being the at-home parent, paid work being necessary but not the main focus. We've tried to be thoughtful and intentional in our parenting. And we never wanted over-scheduled kids and held off on joining outside school activities for a time. We've believed in unscheduled time and running around and riding around on bikes and seeing what adventures we came upon. Despite the idea of one activity per season sounding quite good and something we stuck to in the past, life has changed around these parts. Thanks to visiting an open house at our local music school four years ago, the boys became intensely interested in playing instruments. We held off for a year but then started with the older two. Music lessons suddenly meant one individual lesson, one group lesson per week... x2. OK, four commitments outside of school. And then the young guy began begging to start playing an instrument. And he and one older brother got really into backyard sports and made a plea to try soccer this fall. Do we tell them at ages eight and five that no, you already play an instrument so that's it for right now? I guess we could have but that wasn't sitting right with us. And so we have signed up for local recreation soccer, thankful that it isn't one of these crazy intense ones gearing toddlers for World Cup Play. P loads the twins and the Yuba in the minivan and brings it to the bike shop to have the back tire fixed. With the exception of bringing the Yuba to the bike shop, we did this all by bike. If my math is correct, P and I rode about 39 miles on cargo bikes with our boys, ferrying them to two soccer practices, two music lessons, two birthday parties, and one shopping excursion . How's that for simple living? We had TWO first days of school with F, our youngest, starting preschool last week and the twins, C & S, beginning second grade on Tuesday. 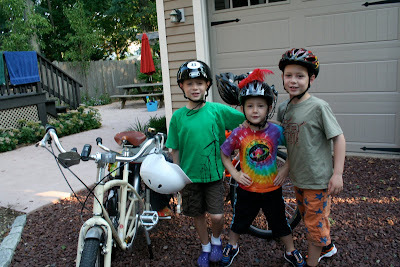 We, of course, had to take first day snaps of both days, including gearing up on our bikes for the commute. Our new daily commuting set-up look like this: P takes F to school on the Xtracycle Radish while I ride the Yuba Mundo with the older fellas (with the bakfiets retired for daily commuting). Notice our sweet new Xtracycle Freeloaders on our Yuba. While we did purchase these sharp-looking Yuba Go-Getter messenger-style bags, we found them too big for daily commuting with boys' legs hanging over the sides. They will be great for big shopping trips, serious hauling, etc. but when we saw that Xtracycle was looking for Yuba and Kona owners to test out their 2010 FreeLoaders, we jumped at the chance and were chosen to participate in the testing, much to our delight. 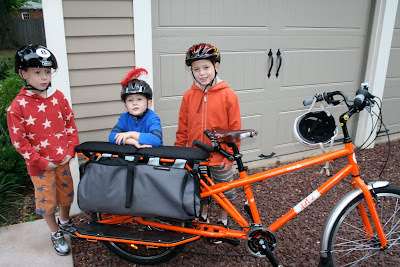 We will be posting a review of how these bags work on our Yuba on the Xtracycle blog, but want to get through a couple of weeks of school commutes, music lesson hauling, and soccer practice runs first to see how the FreeLoaders fit our needs. Initial reaction though = awesome. C & S's first day-- second grade! Clearly, a chillier morning than F's first day of school. Labor Day brought New Haven's big running race. C and S ran the kids' fun run and Peter completed the 5K. Our bikes served us extremely well as streets were blocked off all over downtown and parking for cars was hard to come by. We happily zipped straight down to the Green and found a nice tree to lean the bikes up against, U-locking them twice together. Our long-tails received lots of attention and we especially loved it when the races were over and we could get right out of Dodge, getting nods from the policemen manning the streets, allowing us to ride down roads where no cars were allowed. Ahhhhhhhhhhhh. We had a vision of a world where streets were for bikes first, cars second, and it was good. I started bike commuting because as a member of a one-car family, I needed a way to get from one place to another without buying another car. I wasn't looking to become a bike activist or advocate in any way. As my family started to ride together, we learned what works with biking in our community and what makes cycling here tough. Who doesn't want to make tough things in one's life a bit easier? However, taking on any such formal role of bike advocate just seemed too daunting with three young fellows and a full-time job. 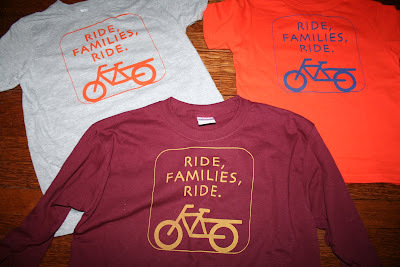 And there are simply logistics that don't work right now: the local community's formal bike advocacy group meets at a time I need to be home to feed my boys; the monthly Critical Mass rides also don't fit our schedule, etc. 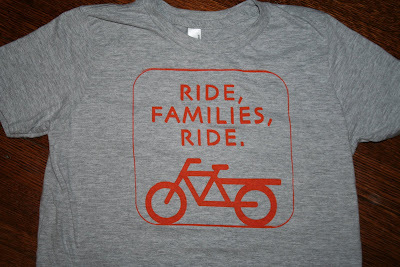 So I stayed content talking with folks whenever people asked about our bikes or riding with kids. I invited friends to join us on bike rides. I kept an eye out for bike events in which we could participate, a few Bike to Work breakfasts, a fun group ride here and there. 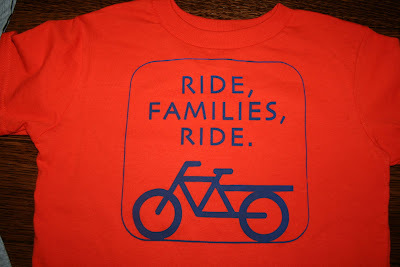 But truthfully, I saw my truest act of bike advocacy as simply riding, riding nearly every day, riding with my kids, being out there and visible. I still think that. But I can feel the urges, the whisperings that I must do more. I must contribute to making my community a place where more parents feel comfortable riding with their children. Where someone contemplates leaving her car parked for the day and rides downtown to the library and knows this is a valid and safe option. Where two friends might go out for the night just using pedal power to get them where they want to go. And I must do more because my family now faces a dilemma. 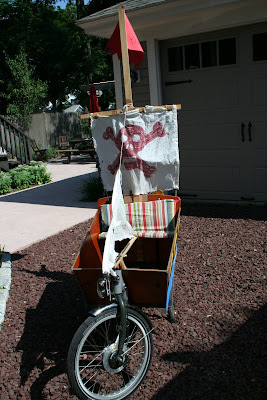 We have three sons and two cargo bikes. We bike far more than we drive. We bike to school, to work, to music lessons, to camp, to church, to the farmer's market, to playgrounds, to friends' homes, etc. 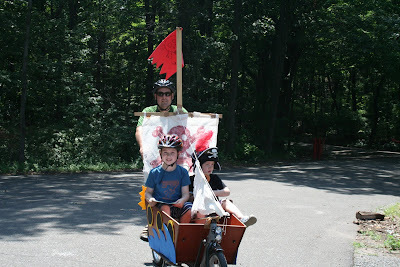 Both my husband and I have grown quite comfortable biking throughout our city with our kids in/on our bikes. 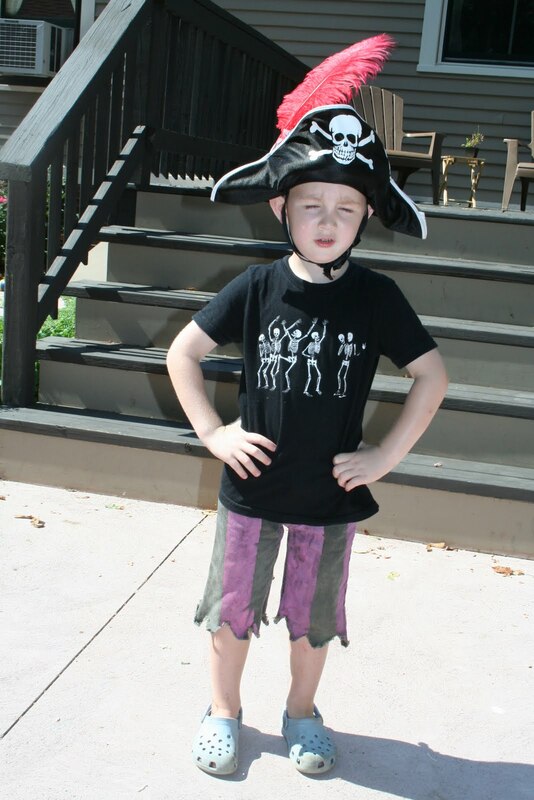 But now-- our oldest two are about to turn eight. And they have grown. 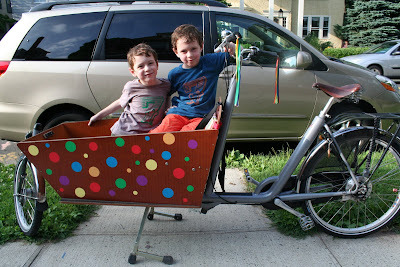 And the truth is, they are busting out of the cargo box on our Bakfiets. Yes, they are quite good cyclists on their own, comfortable riding their two-wheelers, happy to do so for some distance. However, we live in a city that simply does not have the infrastructure to make it safe for them to ride themselves most places. Our route to school brings us right through downtown with lots of impatient drivers racing to get to/from work and no bike lanes. We have no routes that would put us on quieter streets. So what are we to do? Stop biking? We are not ready to do this and I fully resent the idea that we would have to give up bike commuting. Do you live in a place where a young person can safely ride to school, to the library, to camp? Can kids do that in Portland, OR? In Cambridge, MA? In most suburban towns? How about rural communities? I want to learn more. But the truth is, I don't want to move. Not now, anyway. So I need to get advocating in more formal ways. Perform a maintenance task — big or small! Carry a load on your bike — groceries, etc. We decided to pull the family card for a few of these so happily have completed each of them but with different family members involved. 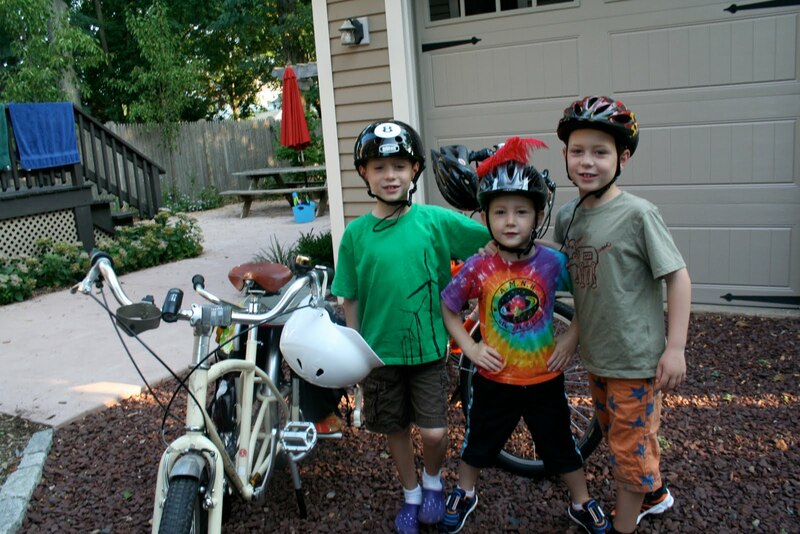 The most exciting challenge for us in this group was taken on by our youngest guy who decided to "test ride" his brothers' two wheelers (no training wheels) and yes, he is off and riding now. He happily checks the tires before he rides and is insistent that he pump up the flats himself so another nod to F for performing our maintenance task-- however small, but necessary! 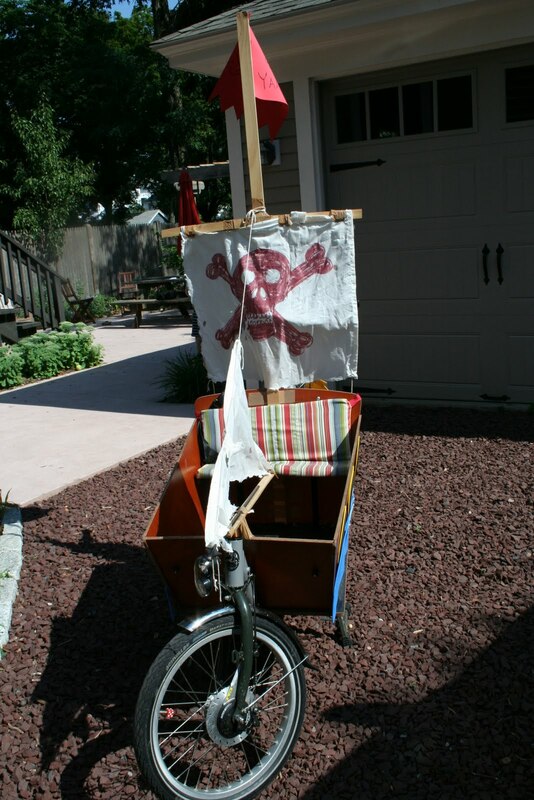 We also took care of decorating our bike with our new Zero Per Gallon ginormous patch! 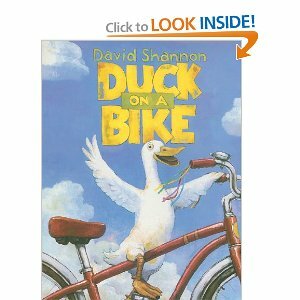 How can you go wrong with a story about a duck who wants to ride a bike? Truly. Fun to hear Duck's friends' reactions (and see their expressions) watching him cruise on two wheels. My boys love author and illustrator David Shannon's books in general and one with farmyard animals AND a bike= cool! Finally-- carry a load on your bike..... Well, this feels like cheating a bit since we are family bike riders so EVERY day both P and I are loaded up with children and their stuff on our two cargo bikes. When we first became parents, I remember a friend commenting, "I am my child's roadie. I have one little bag of stuff and they have two tractor trailers worth of things like a rock star." So we decided to show some snaps of our every day haul. I don't think we have yet mentioned that with the boys taking up that much more room in the cargo box that we expanded our haulin' capacities with a set of gorgeous hot pink, orange, and red Clarijs bags. At least two books-- pictured on top of this post: a Tin Tin collection and one of Rick Riordan's Percy Jackson books. One iced coffee for the tired dad who accompanies one cute musician to his cello lesson then hands off the first cute musician to mom (who has the box bike with their two other sons) who in turns drops off a different cute musician down to the music school for his violin lesson which dad stays for as well-- Whew! We've been riding a ton, writing very little. I have much to blog about & need to keep up reporting on our participation in LGRAB Summer Games events. I couldn't however let yesterday's BIG BIKE EVENT AT OUR HOME pass without marking it here. Our little guy, F, aged four and a half, learned to ride a two-wheeler yesterday. Yes! It was so exciting. He's been on a balance/push bike for over a year and yesterday, my husband raised its seat. F was riding his balance bike up and down our block with ease, lifting his feet higher and higher with longer intervals between putting his feet down. P, watching him, thought F could likely ride one of his brother's two wheelers. F was game. It took only a couple of spills (plus, he hasn't quite gotten stopping down) but off he went. It was truly magical! I have to say thanks to all the bike bloggers out there that talked about bypassing training wheels and just go balance bike to two-wheeler. In this case, it worked perfectly.